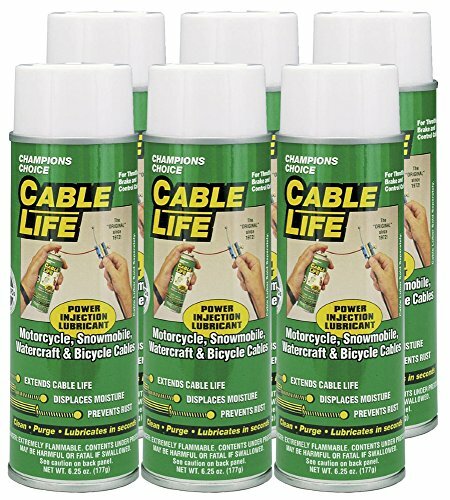 Protect All Cable Life is an excellent wire cable lubricant that cleans, purges and lubricates in seconds. It leaves a non-drying, ultra-thin film that penetrates, lubricates, displaces moisture and prevents rust and corrosion, extending cable life and reducing slop. Cable Life is formulated to work in temperature extremes from high heat and humidity to temperatures down to below 0 Degree Fahrenheit. The cold weather protection makes Cable Life especially effective in protecting cables from freezing in the open position and in preventing snow and ice buildup. Over spray is not harmful to adjourning surfaces or mechanisms. 6-Pack of 6.25 oz. Aerosol Cans. If you have any questions about this product by Protect All, contact us by completing and submitting the form below. If you are looking for a specif part number, please include it with your message.